Weâ€™re thrilled to announce our partnership with UX Mastery. This enterprising group have been educating developers worldwide about the importance of building great user experiences, and weâ€™re pleased to welcome them as our latest publisher partner. At SitePoint, weâ€™re all about building incredible â€” and beautiful â€” Internet things, which should by definition be free of awkward interfaces and confusing interactions. Weâ€™ve been supportive for a long time of UX Masteryâ€™s message that people are more important than technology, and we’re proud to offer their insightful ebook range to our members. From today, UX Masteryâ€™s three ebooks will be available on Learnable, our online learning platform. All Learnable members will be able to access the ebooks online, and annual members will also given the option to download them. If youâ€™re not a member yet, we suggest you join to access these great titles, as well as the extensive SitePoint library. The UX Mastery titles are also available for individual purchase through Learnable. Developers of all backgrounds and levels of experience can gain invaluable insight into the importance of UX with these brilliant books. 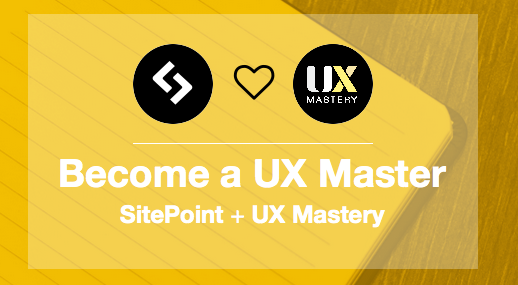 Welcome to the SitePoint family, UX Mastery!